The interplay between the physicality of an idea and the idea itself has long held fascination for visual artists and craftworkers. This is the primary starting point for the work in Imagination Navigation at Abecedarian Gallery. Imagination Navigation takes its title from a monograph about and exhibition of Joseph Cornell’s work. 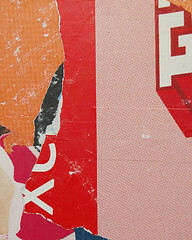 It is a show of 22 works by United States and Canadian artists working in assemblage and collage. The works were selected by Denver artist and exhibitions preparator Dave Seiler (image left). While far from definitive, the exhibition provides a good overview of current trends in small to medium scale mixed media artworks. 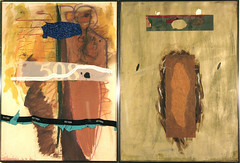 Included in the exhibition are paper works incorporating both cut and torn paper collages by Luis Frias Leal of Greensboro, North Carolina, Mara Rivet of Seattle, Washington, Marsha Balian of Oakland, California, Lili Francuz (image right) of Ft. Collins, Colorado and Robin Miller of Savannah, Georgia. A more painterly approach and in this case less intimate approach to collage is represented by Ken Szmagaj of Harrisonburg, Virginia (image left) and Mercedez Nunez of. 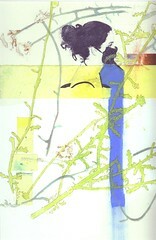 Christine Drake (image above) of Lexington, Virginia uses a monotype as base for collage while Lori Reed of Galesburg, Illinois, Elizabeth Lasley of Asheville, North Carolina, Janice MacDonald of Denver, Colorado and Doug Stapleton of Chicago, Illinois build their collages up from rigid boards or canvas panels. 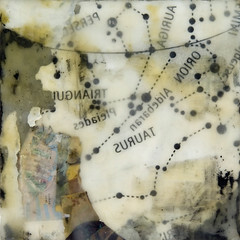 The encaustic collage, a medium growing in popularity, is here represented by Kimberly Flora (image left) of Cincinnati, Ohio. 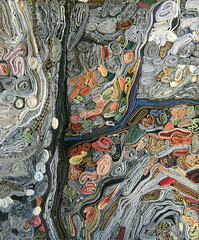 While stitching appears as an element in several of the above mentioned works, only two of the artists in Imagination Navigation focus on fibers and thread, using them both as support and collage element: Nancy Turner from Ontario, Canada and Georgia Rowswell (image right) of Cheyenne, Wyoming. 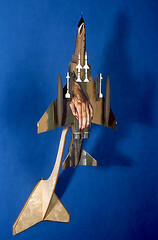 While assemblage works are often sculptural for the most part the assemblage works in this show exhibit on the wall. These include pieces by Annie Onderonk (image left) of Albuquerque, New Mexico, Caroline Waite of Louisville, Kentucky, June Daskalakis of Davis, California, Diane Lou of Willamina, Oregon, Pamela Milld of Lakewood, Colorado and John Ferdico (image right) of Oakland, California. Surprisingly, only two works in the exhibit are viewed ‘in the round’ that of D. M. Suchoki of Scottsdale, Arizona and that of juror Dave Seiler. 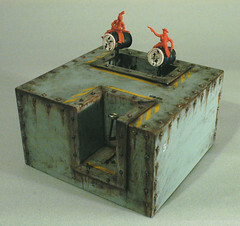 This entry was posted in 2009 Exhibitions, Imagination Navigation and tagged abecedarian gallery, assemblage, collage.